As a blogger technology and electronics are a huge part of my life! Being up on the newest and best in each category is key. However, technology is also an important part of everyone in my families life. Between the game controllers, the three iPods, my laptop, two tablets, and three cell phones for Kevin, myself, and Alana, its madness. 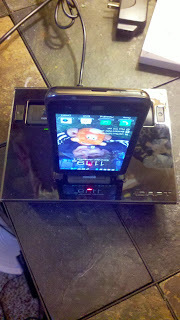 You should see the table we have where we charge all of these gadgets! There are cords every where and usually we are fighting over who can charge what and who's battery is lower needing to charge more! 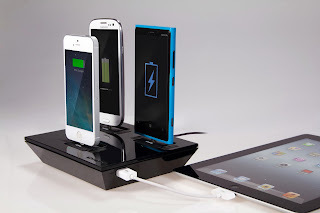 We've discussed getting a universal charging station but never found the right one. Then I was asked to review the newest Idapt i4+ from Idapt. Still I was potentially skeptical as to whether it would work for my techie family. 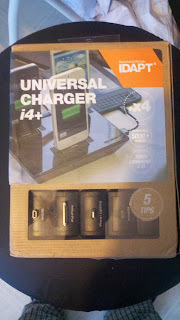 I knew I was wrong the more I read into the universal charger (before even receiving it). If it could do everything it promised I knew we would love it. IDAPT i4+ can charge up to four devices at the same time and is "compatible with over 5,000 mobile electronic devices including the iPhone, iPad, smartphone, Nintendo DS, PSP, GPS systems, digital cameras, rechargeable batteries and Bluetooth products." Can you say wow?! 5,000 devices?? Sounds actually too good to be true. The reason for this is "The IDAPT i4 features an interchangeable tip system making it completely customizable." If for some reason you upgrade your device to a charger port/tip which you don't currently have all you need to do is upgrade to a new tip! This even features a USB output so you can charge these types of gadgets at the same time without having to plug them into the wall as well as needing yet another additional wall outlet. There is an easy on/off button you can use when the LED charging indicator turns from red to green (when its fully charged). I love, love, love this product! 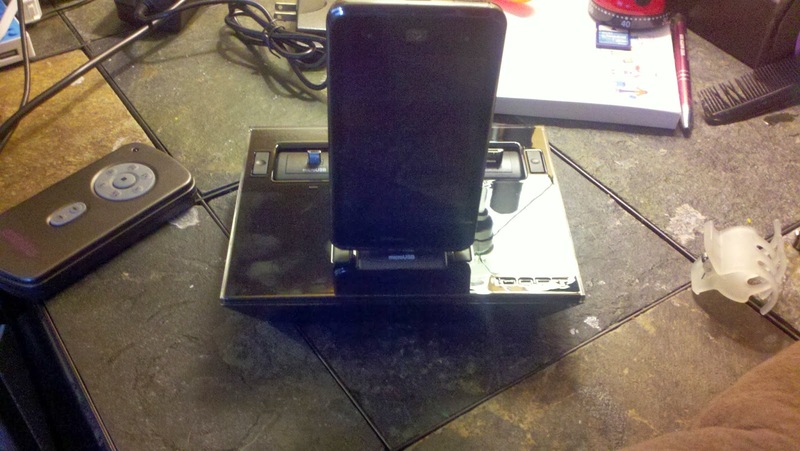 We have been using it for as many devices as possible since it arrived. Our only complaint is that Kevin gets whiny about his phone charging port being on the side of his phone so it doesn't stand upright (which in my opinion is really not a big deal)! I wish this was even bigger so we could charge even more at once but we really have found this to be sufficient even for our family! Recommendation: To be honest you pay 2x this for most phones/devices these days and most of the accessories themselves are a minimum of $30 a piece. Now with this you don't have to worry about purchasing a separate charger for each device (spending probably twice as much as this costs)! Plus when you upgrade you are spending a cheap $10 to add a new tip if need be! Well worth the purchase and makes for a great gift for the techie in your life.